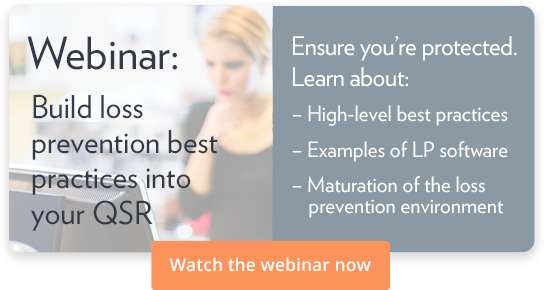 Food safety is among the top priorities for QSR franchisees because their reputation depends on it. So, when Chipotle experienced an E.coli, salmonella, and norovirus outbreak on three separate occasions within three years, franchisees took notice. As a result of the outbreaks, Chipotle created an all-new food safety program to prevent future incidents. There’s a lot to be learned from the company’s new program, but first, you need to understand how these diseases and viruses spread. Three of the most common foodborne diseases are E. coli, salmonella, and norovirus. E. coli and salmonella infections are caused by bacteria, and result in (usually mild) digestion distress. Both infections can be prevented through strict hand- and food-sanitation procedures and ensuring that eggs, meat, and seafood are cooked properly before serving. Norovirus, on the other hand, is much harder to prevent, and the symptoms are much more severe. Norovirus is, as you might have guessed by the name, a virus — so sanitizing and hand washing have a limited effect. The virus can spread through food, water, and even air, so it’s also much harder to stop. Norovirus is a QSR’s worst nightmare. Chipotle’s food safety woes weren’t caused by one bad apple. There were many systemic problems that caused these outbreaks. Chipotle’s newly revised food safety program explains the eight steps the company is taking to re-earn customers’ trust. These steps range from simple restaurant hygiene and food preparation policy updates to supply chain, technology, and leadership changes. The program was a big change for Chipotle, and for good reason — they had a lot of work to do to re-establish the trust they had lost. You probably don’t need to implement changes on the massive scale that Chipotle did, but there are still a few practices you can use in your own restaurants. What goes into a good food safety program? Start with the stores. Make sure your restaurants have clearly established procedures for sanitation and food preparation. A single cough or hastily washed piece of food could make someone sick. It’s not just about minimum food safety regulations. Make sure your employees know that the impacts of coming to work sick or undercooking meat go beyond a slap on the wrist — real people could get very sick. Let your employees know that it’s okay to take sick days. Hold your store managers accountable for their employees, and get your employees ServSafe certified if possible. Check in regularly. Mandated government inspections aren’t enough. Every store should be inspected frequently, both by internal teams and by independent auditors. You should trust store managers to follow food safety procedures, but you should also verify that trust. Chipotle evaluates every restaurant at least every other week and has an independent food safety audit group inspect each store on a quarterly basis. If possible, have your inspectors get HACCP certified. Follow the supply chain. You can only do so much to prevent foodborne illness after the food arrives at your stores. So, it’s important to know where your ingredients come from and have confidence that they’re handled properly along the way. Check in with your suppliers frequently. Ask if they have food safety certifications like HACCP. And don’t stop there. Go farther down the chain if possible. Ask suppliers if they know their farmers’ food safety procedures. Chipotle requires suppliers to routinely verify their food safety procedures with FDA/USDA microbiological testing. It may be best to ask your suppliers to do the same. Stay up-to-date. Establishing strong policies is great, but you need to stay ahead of the game. Chipotle established an advisory council of food safety experts, who continually review their food safety procedures. The council meets regularly to discuss trends, both in the restaurant industry and in the scientific community, and provides updates directly to Chipotle’s board of directors on a regular basis. You may not need to go to these lengths, but the important takeaway is to make sure you’re keeping apprised of ongoing food safety developments in the QSR community. It remains to be seen if Chipotle will fully recover in terms of customer trust from its repeated food safety disasters, but they are still a powerful presence in the QSR industry, thanks in no small part to their robust food safety program. Learn from Chipotle’s experience and implement some of these changes now, before a disease like Norovirus catches your restaurants off guard.